Scanner: "Somehow, into this ordinary life, there appeared a cassette player…"
Robin Rimbaud, aka Scanner, is nothing if not prolific. 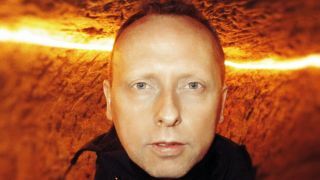 He's just released Scanni, a collaborative album with British composer Anni Hogan - Rimbaud thinks it might be his 70th full-length album! - but is also busy on various soundtrack projects, another solo album, scoring for the Ballet Rambert, festival shows with acclaimed audio-visual experimentalists The Light Surgeons, and even a gig at Google's London headquarters. "I've always been like that," explains Rimbaud from his East Midlands studio/home. "I've got a restless imagination; as soon as one project is finished, I have to move on to something else." Labelling Rimbaud a DJ/producer just doesn't seem right. He's a collagist, artistic instigator, an obsessive collector and organiser of sounds, gallery habitué and passionate avoider of TV - he's not owned one since he was 16! "When I was at school, we used to have a lesson simply called 'Careers'. Each week, the school would arrange for someone to come and talk to the class - a fireman, a policeman - and then we'd write about what we wanted to do after we left school. "I can remember what I said because I still have that piece of paper. I wrote: 'I wish to escape the accretions of a contemporary working life'. What kind of pretentious 15 year-old writes that? But it was true; I just wanted to be involved in art. And, in a bizarre way, it all seemed to work out as I planned." Were you raised in an artistic household? "Not at all. There was a piano in the house, but none of us really played it. All I can remember from childhood is my mum; my brother, who wasn't the least bit interested in making music; and my grandparents. Dad was a motorcycle journalist, but my parents split up when I was little. "At first, I used the pause button to try and create these strange noise collages, but when I was 15, one of my teachers gave me his old reel-to-reel tape machine. That was it; the doors were open. Not only could I record linear sound, but I could also record other sounds over the top. The only problem was that the heads were never aligned, so everything was slightly out of sync and off-kilter. I loved it! It felt as if everything was in a strange time signature." Chances are you can now get a plugin that will recreate the sound of your vintage reel-to-reel's kookiness. "[Laughs] As an adult, I probably would have been bothered by things being out of sync, but as a kid, you just go with the flow. I was doing cut-up, William Burroughs-style loops, then started recording instruments that I borrowed from friends. The Wasp synthesiser, a Moog Prodigy; all running through guitar effect boxes that I picked up from God knows where. "The Prodigy tapes were actually quite interesting, so I stuck them up on the website last year [bit.ly/ScanProdigy], but I have no intention of inflicting my Spider-Man tapes on the world at any point. Or the one of me and my brother listening to Match of the Day." "Every single cassette, reel-to-reel, DAT and CD-R - early versions of songs, found sounds and field recordings. There's probably 40 years' worth, and it's constantly growing." So you still record stuff? You're always on the lookout for an interesting bit of shash? "Always. And, of course, it's so easy with the iPhone. I do have a chunkier Sony machine, but most of it gets done in the phone with a Rode mic - I'm pretty sure that thing goes up to 96k. "I was in Croatia earlier in the year, recording stuff for my sound installation at Rijeka Airport, and I've also been recording the builders in my flat. You never know when you're going to need some hammering and sawing. Or blokes swearing at each other! "The important thing is to keep on top of your recordings; keep them organised. Everything I've done is all stored, sorted and catalogued here at the flat, but a lot of it has been digitised, just so I can get access to it if I want to use it for a track. I've got two Drobos hooked up to the Mac and everything is catalogued by year and project number. If you said you wanted to hear me on a school trip to Berlin in 1978, I could probably find it in five or ten minutes. Then I can cross reference that with my diary…"
You've still got your diaries from 1978? "I've kept a diary every day - every single day - since my 12th birthday." "Yes, but those recordings are better than photographs. Brilliant sense memories of almost every year of my life. I know what I sounded like at 12 years old; I know what I was thinking; I can recall the sound of our TV in the living room. "And, if you want to look at it in purely practical terms, it was probably my obsessive need to collect and catalogue all that stuff which led me towards music and what I do today. You could say I was sampling before the sampler." "It was probably my obsessive need to collect and catalogue all that stuff which led me towards music and what I do today. You could say I was sampling before the sampler." Musically, what were you listening to back then? "One of my music teachers played me some John Cage and it really left an impression on me. I just thought, 'This is music? Wow! I've heard the future'. I immediately went back home and started recording myself banging away on the piano, throwing knives and forks at the strings. I had no idea what I was doing… I was just hitting stuff!" If a 12 year-old did that today, they could probably get a decent YouTube channel out of it! "I could've been a Vlogger. What a shame I missed out on that. "From Cage, I moved onto John Cale by mistake, but that led me to the Velvet Underground and, from there, to all the crazy electronic stuff that was happening, like Throbbing Gristle. Plus Eno, of course, Steve Hillage and Vangelis. My mum took me to see Vangelis in Croydon. All that was being filtered through the music of the day… Bowie, punk, glam, pop." Getting your first sampler must have been a key moment for you. "I worked with a Fostex four-track for a while and even did a few early gigs with me, a guitar, some effects pedals and a little Roland drum machine. But it was the arrival of an Atari and the Akai S1000 that allowed me to do all the things I'd imagined in my head. That idea of arranging and organising sounds suddenly became that much clearer. "The Akai was a thousand quid and the Atari 1040 wasn't much less than that. Spending so much money actually made me feel physically sick. It felt like I was buying a house… investing so much into something I didn't really understand. I owned a computer, but I didn't know what a computer did." I know we're jumping ahead a few years here, but did the shift to digital/onboard feel just as exciting? Or sickening? "Exciting? Oh, absolutely. Look, the Akai was an amazing machine… it still is an amazing machine. I've still got all the discs; occasionally, I will timestretch a drum loop on the Akai because it gives you that wonderful metallic sheen that you don't get anywhere else. Have you seen that Akai app? Actually, you could probably pick the real thing up for 60 or 70 quid these days! "But moving onboard and being able to use the actual computer as the sampler/sequencer just opened up a bunch of incredible possibilities; not to mention the range of computer synths that suddenly became available. Much as I love my old Atari and the Akai, I can stand them next to the Mac and there are light years of difference." RR: "I started with Cubase on the Atari, then Notator, which took me down the Logic path. Logic was fine for a while, but then it started to crash a lot, so I was kind of on the lookout for an alternative. This must have been around 2003 and I did a gig in Montreal with Robert Henke. I watched his live show and was amazed by what he was doing… the intricate patchwork he could weave with nothing more than a laptop. just sat on the computer, but I eventually started messing around with it and started to work out the strengths and weaknesses of each platform. "These days, I work on both and flit between the two, depending on the project. Logic is much better for film projects; it keeps things a lot tighter and you've got the surround sound option. Ableton is great for anything that needs to be worked on quickly; I can get a demo together in half the time it would take me on Logic. "At the moment, though, I'm going through a slightly strange phase in the studio. Up until three years ago, almost everything was done in the box. Yeah, there's always been a mixing desk and a few pieces of hardware in the studio, but the real work was done inside the computer. But there have been some very interesting developments in the hardware world recently… lots of things with real knobs and sliders, modular units. I kind of feel like going back to a situation where the computer is really just a tape machine and all the noises are made out here in the real world." Does that mean you're not a fan of soft synths? "God, no! I love soft synths. I'm not one of those analogue fetishists who think that everything needs to have a knob; it's more to do with technical developments and me wanting to keep utilising the tools that are available. When I was a kid, that meant going from the cassette to the reel-to-reel to the Atari; now it means going from hardware synths to soft synths and then hardware again. We're living in an age when the technological developments are so exciting… it would be ridiculous to just stop and say, 'I am not interested in anything beyond Point X'. "There are certain bits of software that have become staples. I'd certainly struggle without Kontakt. As someone who grew up with samplers, I find it so easy to work with. Yes, you can do all the usual messing around with odd noises and loops, but it's also a very useful writing tool for when I'm putting together a piece of music that will be played by real musicians. I can write for violin, cello, etc, and it will be more than good enough to give a sense of what I'm after. "Omnisphere is brilliant for atmosphere and pads; Reaktor gives you a lot of options; Battery, as you'd expect, handles the percussion. The GForce vintage synths - like the Oddity - are great for basses. I just didn't want to get into a situation where I was swamping myself with soft synths. It's easy to have 30 or 40 synths on your computer, but are you really going to make full use of all of them? "When I work with musicians, they don't all turn up with 30 different violins and guitars. They have their 'instrument' and they're very happy to make music using that one 'instrument'." They both use the guitar, but you can easily tell the difference between Jimmy Page and Jimi Hendrix. They both use the Polymoog, but you can tell the difference between Gary Numan and Kraftwerk. "Exactly! Let's take the piano… a very simple, straightforward instrument that does nothing more than sound like a piano. But if Debussy was playing it, you would know it was Debussy. If Thelonius Monk was playing it, you would know it was Monk. No trickery, no effects, but the character and the voice of each musician shines through. "That's something I think we do have to be careful about in the digital age. In the past, musical instruments were expensive, so most people could only afford a limited studio, which forced them to constantly think and rethink their musical ideas. A bit like a chef who's only got a few things in the fridge; three basic ingredients that need to be made into ten different meals. "The availability of software today means that it's very easy to get into the habit of thinking you need a new piece of kit or a new app to create a new piece of music. Personally, I think it's much more important to find 'your' voice on the equipment that you've already got in the studio. Make that your musical language. Get to know those synths so that whenever you create something, it automatically sounds like you." Scanni, Robin's new album with Anni Hogan, is out now on Cherry Red Records. Find out more about the story behind it at www.scanni.co.uk.